Boeing 747-209B B-18255 was scheduled to fly flight CI611 Taipei-Hong Kong during its last day in service for China Airlines before being sold to Orient Thai Airlines. Weather conditions at Taipei that afternoon where fine: sunny weather, a temperature of 28deg C and easterly winds at a speed of 9 knots. At 14:38 Taipei Delivery cleared Flight 611 to Hong Kong: "Dynasty six one one cleared to Hong Kong Airport via Jessy one departure after Jessy direct to Chali Makung alpha one maintain flight level two six zero expect flight level three five zero at Makung squawk two six six one". The gate closed around 14:50, ten minutes after the scheduled departure time and the crew requested ground start and pushback from stand B2. At 14:57 pushback was completed and the aircraft taxied to runway 06. Ten minutes later the aircraft had taxied into position and was cleared for take off. While climbing through 1600 feet the crew contacted Taipei Approach and received clearance to climb to and maintain FL260 and proceed direct to Chali. At 15.16, while climbing through FL187, Dynasty 611 contacted Taipei Control. The Flight was cleared to climb and maintain FL350 and proceed from Chali direct to Kadlo. Some 13 minutes later, while approaching 35,000 feet, the aircraft disappeared off radar screens. Wreckage and bodies were found at sea, about 45 km Northeast off the Penghu islands. The flight probably disintegrated at high altitude since other debris was found near Changhua, about 45 kilometers from the crash site. 1. Based on the recordings of CVR and FDR, radar data, the dado panel open-close positions, the wreckage distribution, and the wreckage examinations, the in-flight breakup of CI611, as it approached its cruising altitude, was highly likely due to the structural failure in the aft lower lobe section of the fuselage. 2. In February 7 1980, the accident aircraft suffered a tail strike occurrence in Hong Kong. The aircraft was ferried back to Taiwan on the same day un-pressurized and a temporary repair was conducted the day after. A permanent repair was conducted on May 23 through 26, 1980. 3. The permanent repair of the tail strike was not accomplished in accordance with the Boeing SRM, in that the area of damaged skin in Section 46 was not removed (trimmed) and the repair doubler did not extend sufficiently beyond the entire damaged area to restore the structural strength. 4. Evidence of fatigue damage was found in the lower aft fuselage centered about STA 2100, between stringers S-48L and S-49L, under the repair doubler near its edge and outside the outer row of securing rivets. Multiple Site Damage (MSD), including a 15.1-inch through thickness main fatigue crack and some small fatigue cracks were confirmed. The 15.1-inch crack and most of the MSD cracks initiated from the scratching damage associated with the 1980 tail strike incident. 5. Residual strength analysis indicated that the main fatigue crack in combination with the Multiple Site Damage (MSD) were of sufficient magnitude and distribution to facilitate the local linking of the fatigue cracks so as to produce a continuous crack within a two-bay region (40 inches). Analysis further indicated that during the application of normal operational loads the residual strength of the fuselage would be compromised with a continuous crack of 58 inches or longer length. Although the ASC could not determine the length of cracking prior to the accident flight, the ASC believes that the extent of hoop-wise fretting marks found on the doubler, and the regularly spaced marks and deformed cladding found on the fracture surface suggest that a continuous crack of at least 71 inches in length, a crack length considered long enough to cause structural separation of the fuselage, was present before the in-flight breakup of the aircraft. 6. Maintenance inspection of B-18255 did not detect the ineffective 1980 structural repair and the fatigue cracks that were developing under the repair doubler. However, the time that the fatigue cracks propagated through the skin thickness could not be determined. Taiwan grounded China Airlines' four remaining Boeing 747-200 cargo aircraft for safety checks May 26. 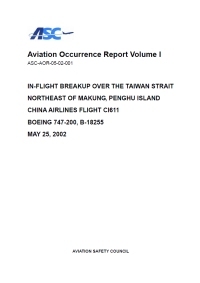 Preliminary results of the investigation into the May 25, 2002 accident of a China Airlines Boeing 747 of Taiwan led the NTSB to issue four safety recommendations on April 8, 2003. They address possible improper repairs to the airplane pressure vessel which may be hiding damage, allowing the development of multiple-site fatigue damage and fatigue fracturing that could lead to structural failure. The ASC strongly recommends that all civil aviation accident investigation agencies to collaborate with their regulatory authorities to take appropriate action requiring all operators of transport-category aircrafts with pressure vessel repairs. Identified as a result of structural damage other than those covered by Boeing service bulletin documentation ASB B747-53A2489 for an immediate inspection on the repaired area to determine whether any hidden damage is present. An improperly treated scratch on the aircraft pressure vessel skin, especially if covered under a repair doubler, could be a hidden damage that might develop into fatigue crack eventually causing structure failure. Ensure that the process for determining implementation threshold for mandatory continuing airworthiness information, such as RAP, includes safety aspects, operational factors, and the uncertainty factors in workmanship and inspection. The information of the analysis used to determine the threshold should be fully documented. Encourage operators to establish a mechanism to manage their maintenance record keeping system, in order to provide a clear view for inspector/auditors conducting records reviews. Encourage operators to assess and implement safety related airworthiness requirements at the earliest practicable time. Consider the implementation of independent power sources for flight recorders and dual combination recorders to improve the effectiveness in flight occurrence investigation. Consider adding cabin pressure as one of the mandatory FDR parameter. Closely monitor international technology development regarding more effective non-destructive inspection devices and procedure. Re-assess the relationship of Boeing’s field service representative with the operators such that a more proactive and problem solving consultation effort to the operators can be achieved, especially in the area of maintenance operations. Develop or enhance research effort for more effective non-destructive inspection devices and procedures. Perform structural repairs according to the SRM or other regulatory agency approved methods without deviation, and perform damage assessment in accordance with the approved regulations, procedures, and best practices. ASC should coordinate with the Ministry of Defense to sign a Memorandum of Agreement for the utilization of the defense tracking radar information when necessary, to improve efficiency and timeliness of the safety investigations. ASC should coordinate with the Ministry of Justice to develop an autopsy guidelines and procedures in aviation accident investigation. Review the record keeping system to ensure that all maintenance activities have been properly recorded. Assess and implement safety related airworthiness requirements, such as the RAP, at the earliest practicable time. Review the self-audit inspection procedures to ensure that all the mandatory requirements for continuing airworthiness, such as CPCP, are completed in accordance with the approved maintenance documents. Enhance maintenance crew’s awareness with regard to the irregular shape of the aircraft structure, as well as any potential signs that may indicate hidden structural damage. Re-assess the relationship with the manufacturer’s field service representative to actively seek assistance and consultation from manufacturers’ field service representatives, especially in maintenance and repair operations. Ensure that all safety-related service documentation relevant to ROC-registered aircraft is received and assessed by the carriers for safety of flight implications. The regulatory authority process should ensure that the carriers are effectively assessing the aspects of service documentation that affect the safety of flight. Consider reviewing its inspection procedure for maintenance records. This should be done with a view to ensuring that the carriers’ systems are adequate and are operating effectively to make certain that the timeliness and completeness of the continuing airworthiness programs for their aircraft are being met. Distance from Taipei-Chiang Kai Shek International Airport to Hong Kong-Chek Lap Kok International Airport as the crow flies is 801 km (501 miles).